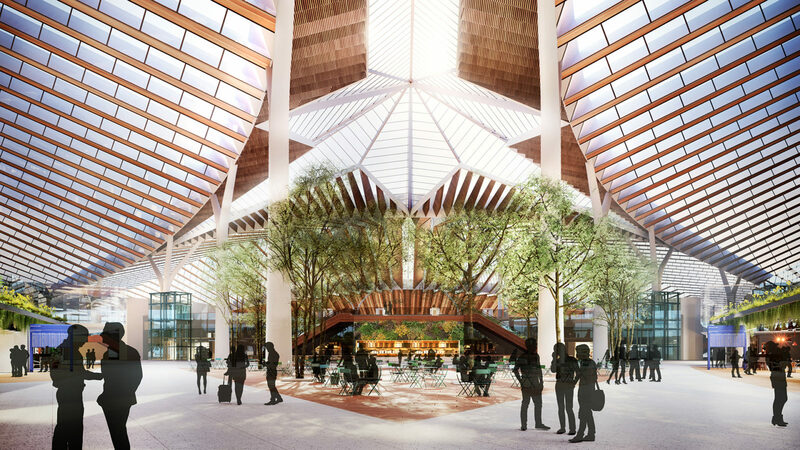 FOR IMMEDIATE RELEASE—The City of Chicago unveiled the finalists an international competition to design the first global alliance terminal in the United States. Studio ORD, a collaborative effort led by Studio Gang in partnership with Solomon Cordwell Buenz (SCB), Corgan, Milhouse Engineering and Construction, and STL Architects, presents a design for a new Global Terminal and Global Concourse that celebrates Chicago’s history as a city shaped by lines of movement and extends that legacy for the 21st century. Like the confluence of the Chicago River, the design’s converging three branches create a central hub that establishes a vibrant new neighborhood in the heart of O’Hare’s campus. Curving to increase efficiency, wayfinding, and connectivity, the tripartite form merges terminal and concourse into a single building. At the branches’ confluence, a dramatic Oculus welcomes visitors under a six-pointed glass skylight whose geometry references the Chicago flag. When seen from above, the building greets passengers with a easily recognizably Chicago icon: the city’s “Y symbol,” or Municipal Device, that represents the branching Chicago River. Beneath the Oculus, a vibrant new neighborhood unfolds around an expansive Central Green that can support pop-up events, music, and informal gathering. The plantings extends through the terminal’s three branches, framing boulevards of restaurants, shops, and retail that together evoke a lively Chicago street. Surrounding the Oculus, a pleated roof of long-span steel trusses clad in wood maximizes natural daylight and energy efficiency. The roof is supported by Y-shaped columns spaced over 100 feet apart that distribute the structural load to maximize open circulation and ensure flexibility to accommodate change over the terminal’s lifespan. A light-filled Mezzanine above the concourse houses ticketing and security for departing passengers. Culminating in a dramatic Overlook, the Mezzanine offers expansive views of the airfield beyond and of the neighborhood and gates below, helping passengers orient themselves and heightening the excitement of travel. A Chicago-based team led by MacArthur Fellow Jeanne Gang, Studio ORD is a true confluence of visionary design, unparalleled operational expertise, and proven ability to deliver in Chicago. A Joint Venture between Studio Gang, SCB, Corgan, Milhouse, and STL, Studio ORD was formed to realize the City’s ambitions for a new Global Terminal and Global Concourse at O’Hare International Airport. Founded by American architect Jeanne Gang, Studio Gang is an architecture and urban design practice headquartered in Chicago and the lead designer on the O’Hare project. Known for innovative buildings that enhance the public space around them, Studio Gang has completed such award-winning Chicago projects as the Aqua Tower, Writers Theatre, Eleanor Boathouse, and the under-construction Vista Tower which, when complete, will be the third tallest in the city. In addition, Studio Gang is currently designing civic, cultural and educational projects across the Americas, including the new United States Embassy in Brazil, an expansion of the American Museum of Natural History in New York and a new campus for California College of the Arts in San Francisco. SCB is an architecture, interior design, and planning firm with a thoughtful design vision and a dynamic national imprint. Founded in 1931 and headquartered in Chicago, SCB has made a lasting visual impact on skylines, campuses, and neighborhoods nationwide. SCB has completed 500+ projects in the Chicagoland region including aviation, large-scale and complex mixed-use and civic projects, and some of the most innovative sustainable projects in the region. Corgan is a leading design firm with proven technical experience and a reputation for great service. Consistently ranked as one of the top five architecture firms, we listen to our clients and transform their insights into structures and spaces that inspire, inform and innovate. For eight decades, Corgan has developed a specialized expertise in aviation and possesses the resources to solve the most complex issues at any airport. We believe we are part of something greater than ourselves and that our work should have a positive impact on the world. We combine a sound functional operational approach with a sensitivity to aesthetic value that leads to highly successful environments. Milhouse is a dedicated, multidisciplinary team of over 200 professionals with individuals licensed in multiple states. Milhouse brings a palpable enthusiasm to the work we do and the people we do it with, plus a devotion to our communities that’s as real as it gets. Our goal is simple: to help our clients integrate their systems, reduce costs, and improve operations in a safe and reliable manner. Milhouse delivers superior solutions to complex engineering and construction challenges around the globe. STLArchitects is an architecture and urban design firm founded in 1996 and headquartered in Chicago. With projects in the US, Europe and Asia, STLArchitects’ design work has been widely recognized for its design excellence and has been published worldwide. The work of STL is diverse, ranging from master plans to small cultural centers and large educational facilities to compact private schools. Projects such as the Lycée Français de Chicago, winner of the 2018 AIA Distinguished Building Award, Back of the Yards High School, and Williams Field House have solidified STLarchitects as one of Chicago’s leading architecture firms.